Nowadays, simulation is used in most areas of modern instrumentation to design or optimize measurement systems. Depending on the application it is useful, or even crucial to go above pure FEM-simulation and combine different analytic or semi-analytic methods. In doing so, a bigger measuring chamber i.e. 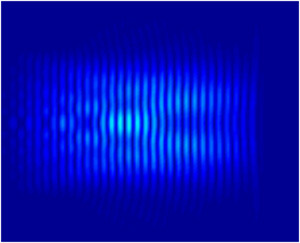 in form of a waveguide can be described, with a corresponding analytic approach and by this reduce the part of the region of interest which has to be calculated with FEM-simulation to a practicable size. Going the analytical way also the propagation of the free-field over longer distances, for example by using Point Source Synthesis (PSS), can be detached from the FEM-simulation and this way enables a view on a larger area. Finite Element Method (FEM) offers the possibility to appraise the characteristics of ultrasonic measurement systems while still in development. 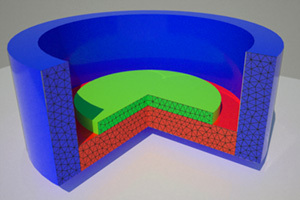 Depending on the geometry two-dimensional slices, rotationally-symmetrical models or three-dimensional constructions are simulated. Many questions in the area of FEM-simulation are concerned with the optimization of i.e. transducer geometries or the combination of different materials. Here, besides the pure FEM-simulation, also a flexible simulation-model and an adapted optimization strategy are necessary. When working with script based modelling, the model is constructed so that all properties (size and shape, material, stimulus), relevant for the optimization, can be varied by the algorithms and that an optimum can be found. Depending on the problem different optimization strategies are used, i.e. genetic algorithms or gradient descent. When working on problems with a large area of interest, i.e. when computing radiation characteristics, PSS can be an alternative or an enhancement to FEM-simulation. With the help of complex transfer functions and with respect to frequency-dependent absorption a pressure field's distribution can be calculated. This way, free-field areas, for which the necessary fine regional discretization would take up too much processing power, can be solved analytically and combined with FEM-simulation. The combination of FEM-simulation with PSS or other (semi-)analytical methods is called hybrid simulation.